On all the four sides, tall mountains embedded with lush pine trees looking like a canopy of pine trees in a row surrounds you.It looks like a fort of mountains in the distant horizon. The clouds drift over the peak of these majestic mountains in a poised, slow and rhythmic pace as if reluctant to let go of the hills. I told you! It is for real! You stand on a flat land with fields on all sides on the ground, with beautiful flowers of vibrant colors like red, pink, purple, yellow, white and many more borders these light green colored fields. You hear the bustling sound of the river flowing next to the street, and the river magnifies the beautiful town, running through the town befittingly and unperturbed. 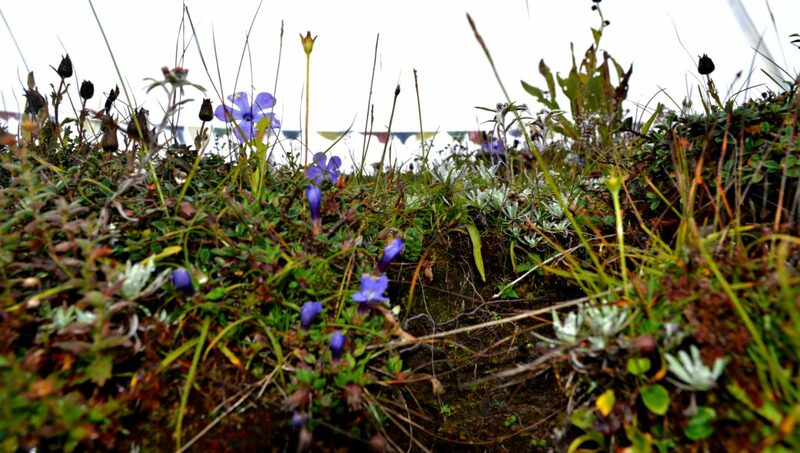 This is no imaginary world, but a city in the little country of Bhutan bestowed with the bounty of nature. 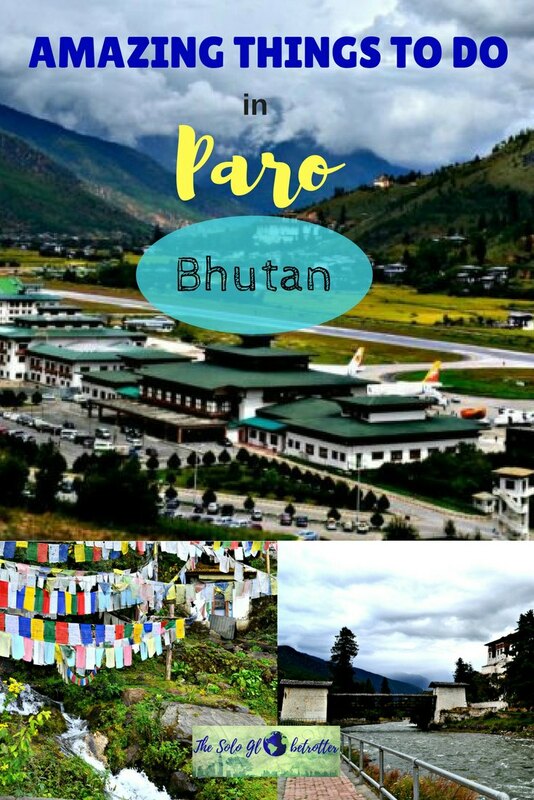 These are the views which I witnessed every moment while I was in Paro – my first stop after getting the entry permit in Phuentsholing. It was like I’d been transported to some magical land in a wonder world. My words might seem poetic here, but this is what I felt waking up to the majestic views, rambling through the street of Paro. There are many places to check out for a regular tourist, and you’ll need a maximum of 3 days to cover it all. But Paro deserves much better than this. 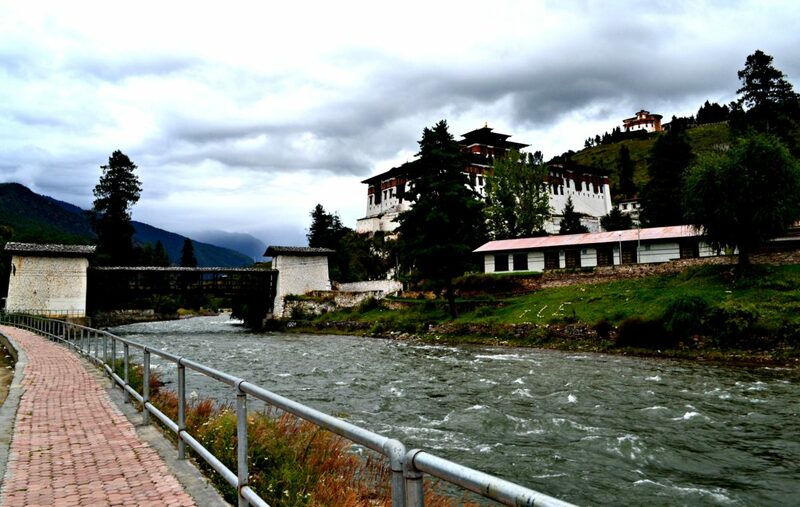 It’s not just the trek to the mystic tiger’s nest or the spectacular Paro Dzong. 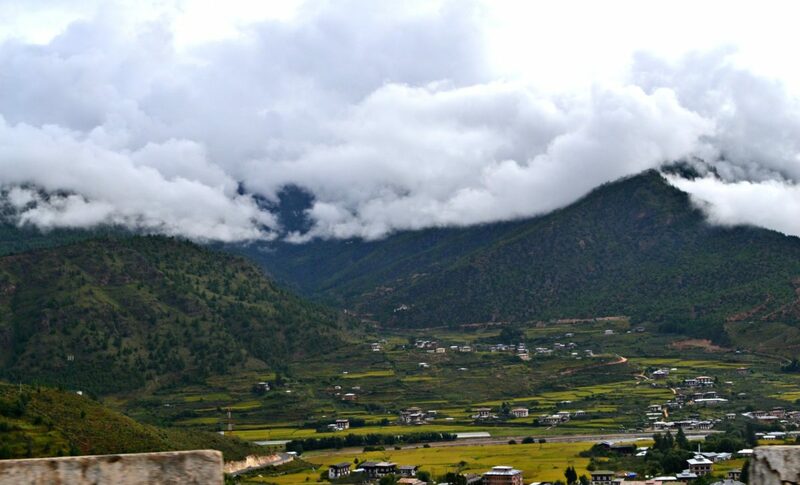 There is something in the air of Paro, a sense of blissful tranquility and abundant beauty. And the moment you land in this town, the spell is cast upon you, making you smile. It’s as if involuntary. Because it is difficult to curb your joy once you see the beauty of this town. The panoramic view of the town is exhilarating and I never get enough of this town, literally, despite clicking more than 500 photographs! 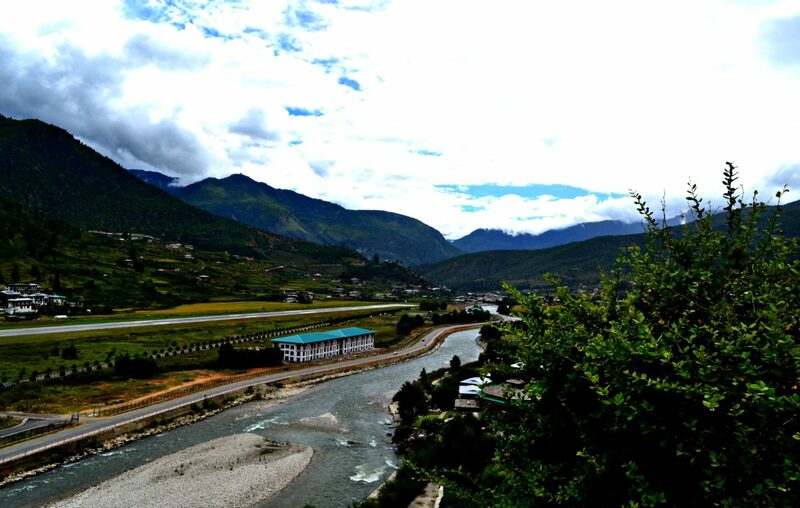 I didn’t get to witness the beauty of Paro the moment I landed in. Because darkness had set in by then. 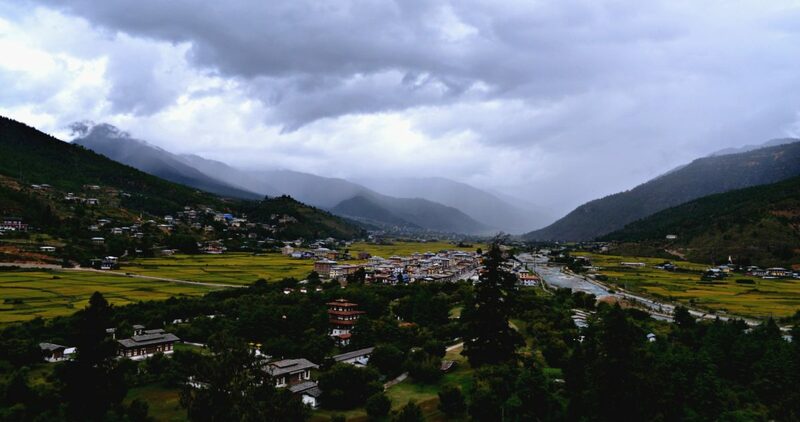 I’d boarded a bus heading to Thimphu on the advice of a man at the ticket counter and was about to get down at Chunzom, as there were no direct buses to Thimphu for the day. By the time the bus reached Chunzom, it was dark. The driver had taken the responsibility of ensuring that I reach Paro. So much that he’d made an arrangement with a woman who was a regular passenger on that bus. He’d requested her to drop me in Paro. Without having any slightest clue about what’s going around me, I’d dozed off into my dreams, when the girl next to me woke me up. She pointed to the driver and the driver was telling something I couldn’t make out, mostly because I was half asleep. A woman got down along with me and the driver hurled my backpack from the top of the bus and waved goodbye, indicating me to join with that lady to Paro. I smiled at the woman, who took me to a cab and asked me to sit in. I was amazed by the gesture of the driver who took my responsibility and by the hospitality of the woman. I was being taken care by the locals because they knew that I was traveling alone and I’d to be taken ‘good’ care. My respect towards these people grew ten folds, and my heart was filled with gratitude for their immensely useful nature. I chit chatted my way with a woman, who introduced the man driving as her husband. Apparently, he was a customs officer at the Paro airport, and the lady was an advocate. They give me a brief about the town and told things about their country. After riding for about 25 km, they dropped me right in front of the hotel I’d booked. I thanked and bid goodbye, having totally enjoyed my ‘planned’ hitchhike. 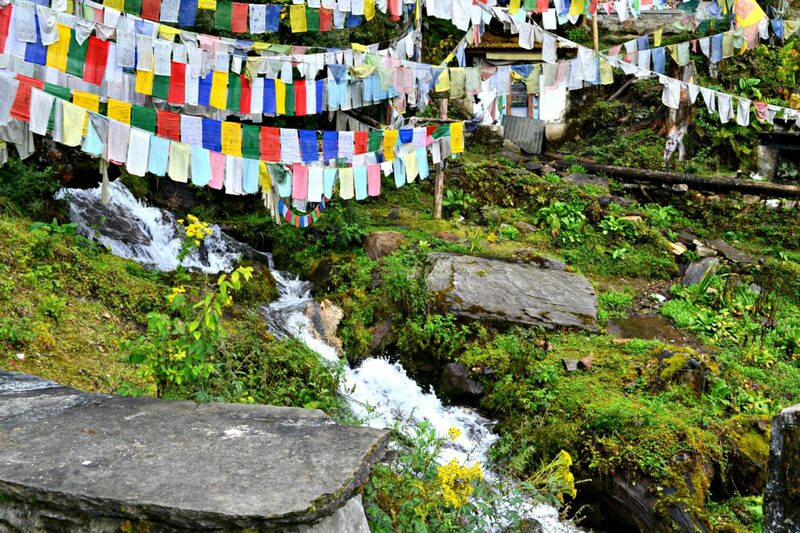 Chele-La pass is one of the recommended places to check out in Paro. La in Dzongkha means Pass and Chele La is one of the highest passes at an altitude of 3989 m. I enjoyed the drive to the top of the pass. 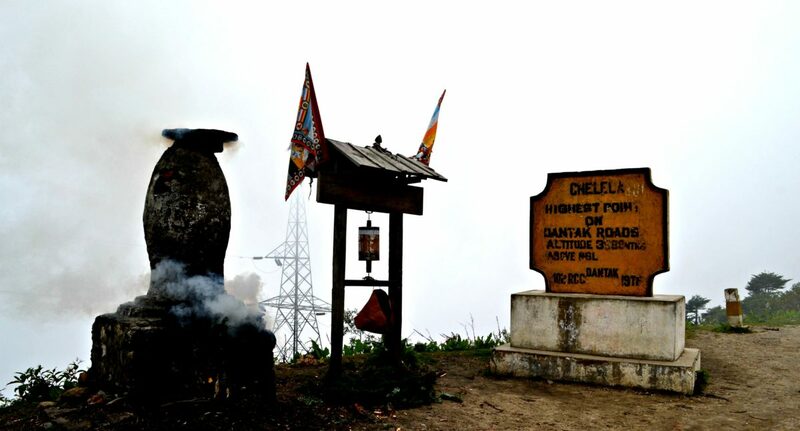 Passing through gorgeous views of the valleys, streams, rushing waterfalls, Alpine flowers, perfect weather and clouds drifting over the lands – the journey itself is sometimes more beautiful than the destination as the adage goes. And this was one of those journeys. Stopping by to enjoy the view, click the waterfalls flowing on the road and living in the moment was bliss. 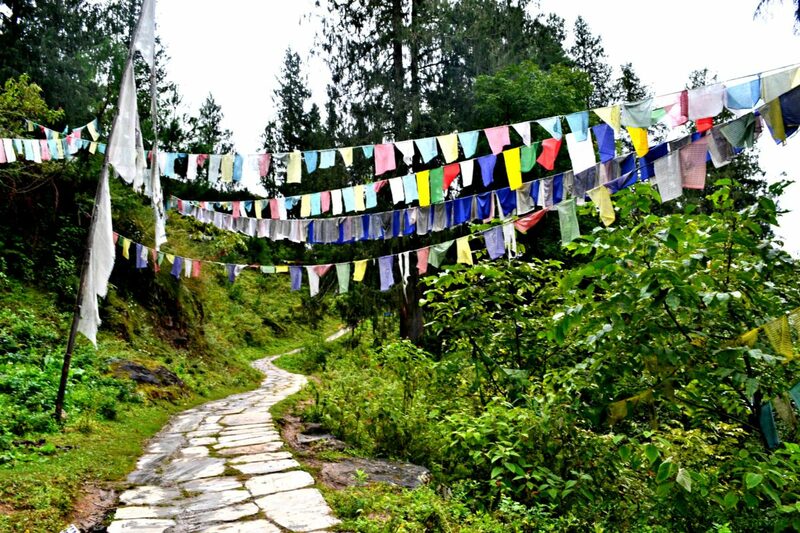 Most of the people in Bhutan just love Bollywood. And the cab drivers change the songs in an instant if they have India tourists in their car. I had to bear through the usual Bollywood songs which sounded so inappropriate given the majestic beauty. In my mind, I preferred to listen to their local songs, which was quite melodious, soothing and in synchronous with nature outside. But my prayers remained unanswered most of the time. 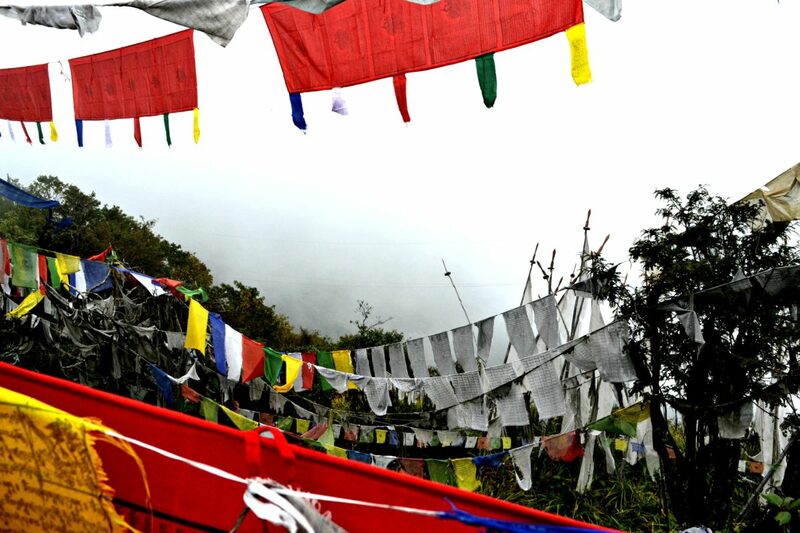 So after tolerating the ‘Blue Eyes’ and the likes for what seemed like forever, I reached the pass and loitered amidst the heap of prayer flags. A thick fog had engulfed the pass, with the view entirely covered my the mist. A cool breeze welcomed me to the valley where I was the only tourist landing there at the moment. Locals were burning the firewood to keep warm, and I stood there taking in the views and clicking to my heart’s content. Drugyel Dzong stands tall, ingrained with gorgeous architecture and bears a testimony to the war bygone. It’s ruined walls and the fort welcome tourists and narrate the tales through whispers. The war over Tibet was the birth of this fort, built around 16th century. 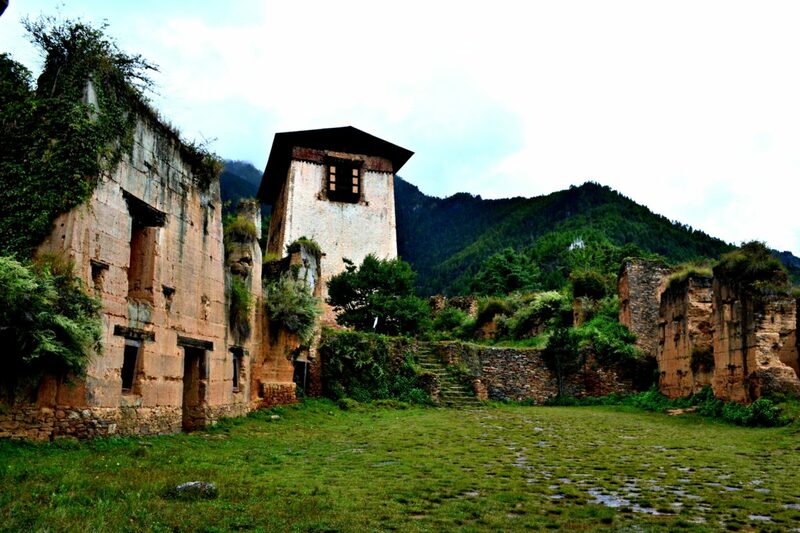 The Dzong looks beautiful even in its ruins, towering over the valley as if symbolizing the pride and the honor. 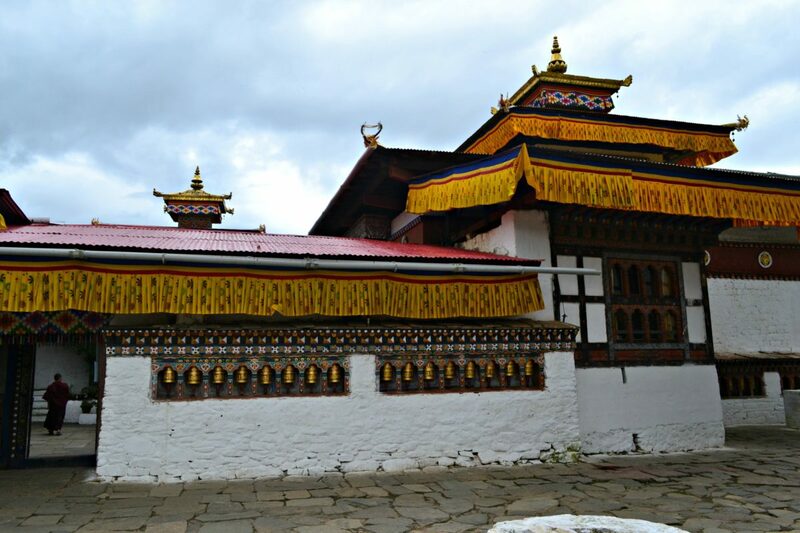 Kyichu Dzong is another beautiful monastery in Paro, flanked by the lush green fields on its sides. 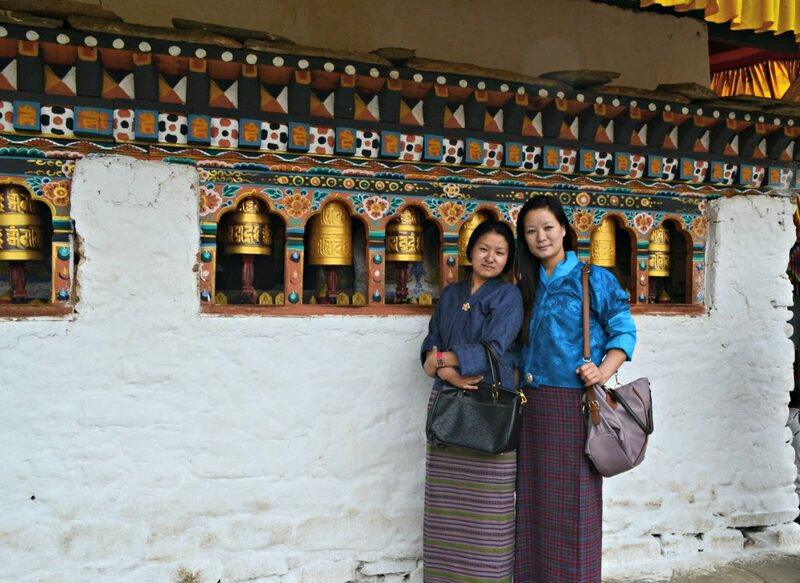 The monastery resounded the silence and the serenity, much like the essence of Bhutan – like the air of Bhutan which emanates peace and joy everywhere. I met two trainee teachers here – who were receiving training to teach Dzongkha – the language of Buddhism(also the local language) and English.I just loved their Kera, which looked elegant. After chit chatting a while about Paro, India and witnessing their happy expressions for my Buddhist tattoo which is the Dzonghka, bid them goodbye. Each of these places told their stories, the past of which now adorns the pages of history, the faith of which is ingrained in the hearts of the people, the beauty of which stretches beyond the horizon. I was influenced by all these, all at once and more than once. It was an overwhelming feeling where my heart sang in happiness, with its wanderlust getting satiated temporarily.